Eckington School’s LEGO robots team, the ‘Eckboteers’, won the teamwork award in the national final of the LEGO Robotics Challenge. 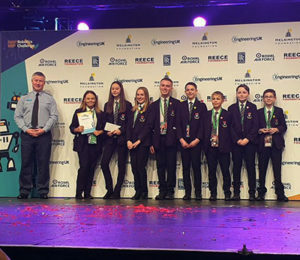 The national competition, which took place at the Big Bang Fair, NEC Birmingham saw entries from over 40,000 schools. The team made it to the final after winning the regional round of the tomorrow’s engineers LEGO robotics challenge in Doncaster earlier this term. The competition final required students to present to judges and complete a series of challenges. Olivier, Rory and Tom impressed the judges on the RAF robot challenge and well done to Sam and Luke on presenting your research on the use of drones for humanitarian aid.